A few weeks ago we reviewed the spider-infested book The Hatching. This was preperation for the launch of the much anticipated sequel Skitter. Skitter follows on directly from the dramatic events of the previous book and once more we are thrown into the middle of spidergeddon. Haven't read The Hatching? read that first and come back as there isn't really any way of explaining Skitter without some spoilers. The first wave of spiders have died out, leaving countless millions of people dead around the world, half of China nuked and a great deal of shiny, occasionally sticky, egg-sacks dotted about the globe. The one in Japan is the size of a truck. US President Stephanie Pilgrim may just have to enact something known as The Spanish Protocol (nobody expects the Spanish Protocol). Spiders again, those critters that many just can't abide. They've been on the planet for over 400 million years and today can grow up to a foot long (goliath bird eating spider) however there is a bigger chance of being run over by a bus than being killed by one (there were only around 100 reported deaths from Spider bites in the 20th century). Statistically there is a bigger chance of being killed by a large mammal such as a cow or horse (especially if you live in the US). That doesn't stop many of us disliking, or indeed fearing them (and I'd probably fear them myself if I lived somewhere like Australia where pretty much everything is deadly). I think it's also worth considering that according to the National Geographic we've only recorded around 14% of the planets species. Given that most large animals are likely discovered, that means many of these 86% are small creatures - such as insects and spiders. We've discovered 46,000 (ish) species of spider, that means there could be a heck of a lot more undiscovered skittering critters out there. In Australia alone there are 3,500 recorded species with 50 new species of spider discovered just last month, including those that jump, swim, dance and mimic (but none yet that swarm). Anyway, as mentioned in The Hatching review, how much you consider this a horror novel is a direct correlation to how much you fear those skittering crawling things with the blue blood and strange hairy bodies. In style Skitter is very much a thriller, with a tight and well paced, dynamic plot. The author makes good use of tension to create some dramatic (and for some, scary) moments. The action isn't limited to just the US either, as the book travels to Japan, India, Scotland, France, Germany and other areas of the globe. Interestingly much of the book deals with the aftermath of the destruction wrought by the spiders while building tension towards new spider problems. The Spanish Protocol makes a great deal of sense in a Country the size of the US - even if it does sound a bit like the name of a dodgy thriller. It does however highlight the lengths that sometimes governments have to go, sacrificing some for the survival of the country or indeed the human race. It's worth noting that Skitter is the middle of a trilogy and has the appropriate nail-biting ending that makes you crave the conclusion. It feels very much an Empire Strikes Back moment, a great story in itself (you could read it stand-alone if you really wanted) but also clearly moving towards a big finish come the third book. We get to see a bit more of the principal characters including FBI Agent Mike, spider expert Melanie and of course US President Stephanie and Aide Manny, amongst others. While there isn't a great deal of time spent building character for each, it's enough and doesn't do so at the expense of driving the story foward. 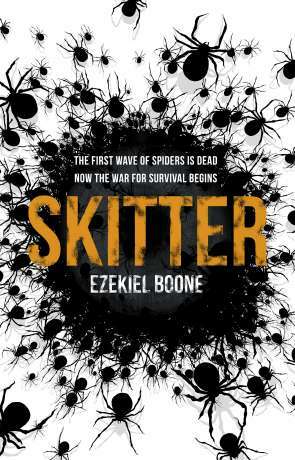 Skitter does everything a follow-up needs to, building on the original, continuing to grow the characters and above all presenting a thrilling, clever and entertaining story. You may never look at spiders in quite the same light. Written on 2nd May 2017 by Ant.